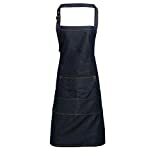 Denim bib apron with contrast stitching. Adjustable buckle on the neckband. Copper rivets. Four pocket compartments. 86cm long and 72cm wide. Washing Instructions Domestic wash 60°c. Industrial laundry 85°c. This entry was posted in Gothic Discount Clothing and tagged Apron, Jeans, Stitch, Unisex by Vivid Dark. Bookmark the permalink.